Jay Schwinn was living the American dream as a Merrill Lynch executive when the entire U.S. financial sector imploded in 2008. 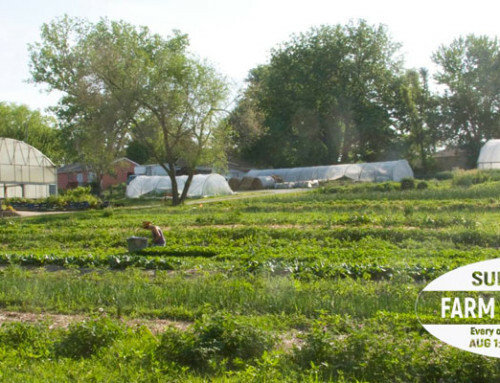 After being bought out, he called his brother, Joe, asking if he could use a partner on his small vegetable farm outside Leavenworth, Kan. His brother, while apologetic, was firm: no way could they could grow enough vegetables to support the two of them. Fair enough, Jay thought, vegetables are out. But what about something else, something non-vegetative, something that would both complement the farm and enhance its profitability? With a half-formed idea percolating through his head, he booked a flight back to a life he thought he had left behind. 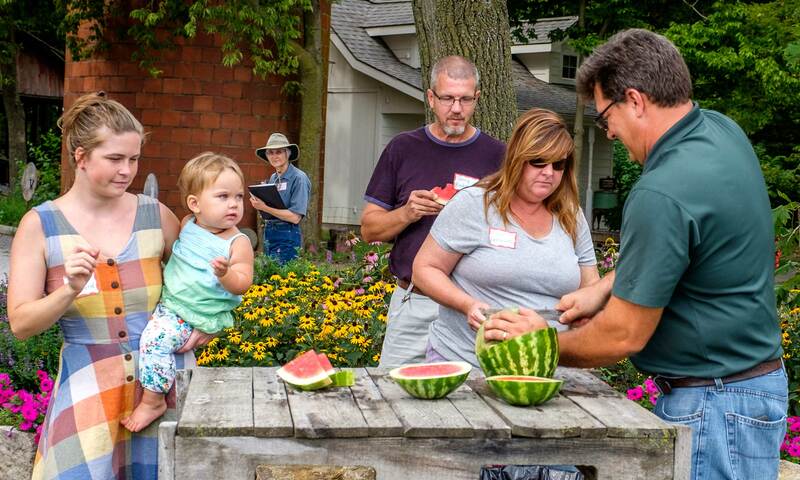 Jay Schwinn, of Schwinn Produce Farm and Barn, slices watermelon for those on last month’s second Summer Fun Farm Tour. Like Schwinn, Don and Loretta Craig, casualties of corporate consolidations, found themselves turning to an agrarian lifestyle that was both familiar and utterly baffling. As they settled into their new lives on a 20-acre hayfield in Basehor, their plans revolved around creating a homestead, not a farm, a distinction based upon an independence from everything they had worked for and believed in. 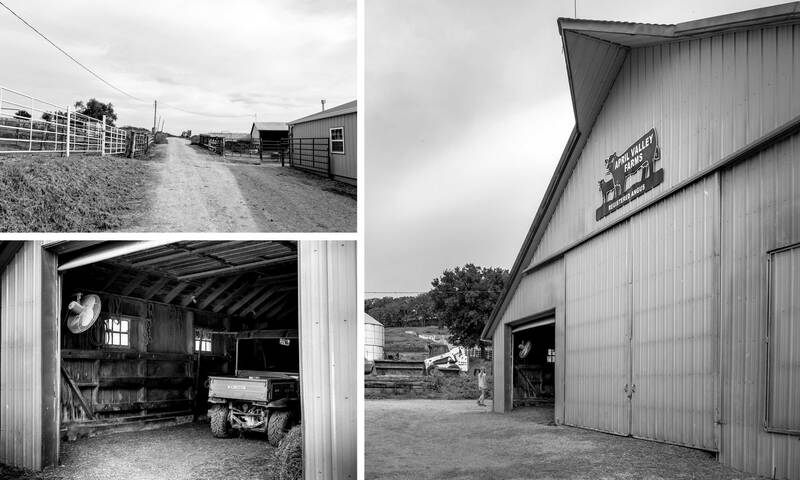 When Ed and Alice Theis founded April Valley Farms in 1956, they had 12 registered Angus females and six bred gilts, plus wheat, corn and hay under cultivation. As the farm expanded and diversified into row crop production, a registered Angus cow operation and a farrow-to-finish swine operation, three of their four sons—Mark, Jerry and Larry—are introducing new technologies that will make the farm more efficient and productive while still adhering to their father’s vision. 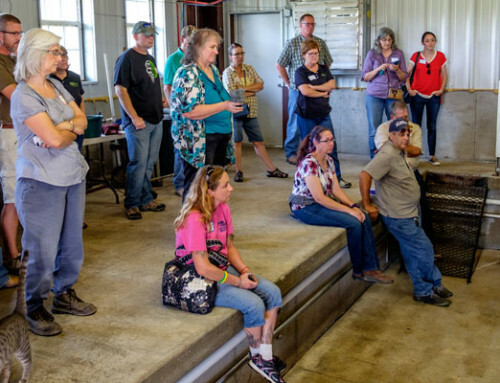 Their stories and their farms were the focus of the second Summer Fun Farm Tour, sponsored in part by Kansas Farmers Union and the Farmer Veteran Coalition of Kansas. 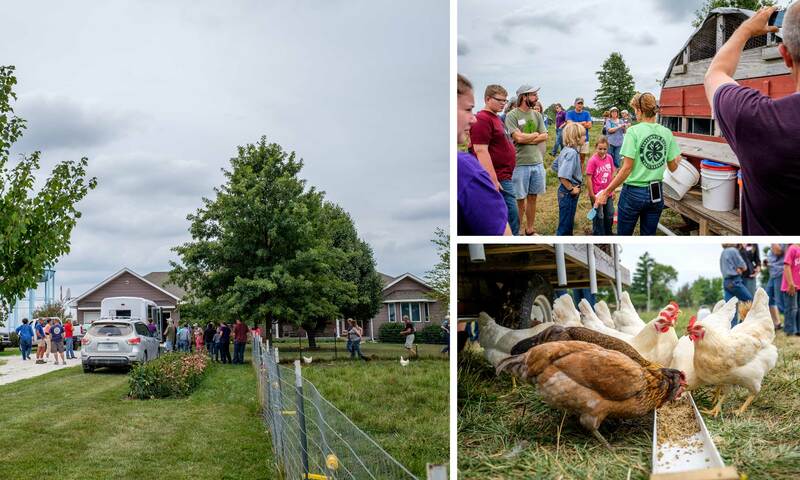 Three tours were planned for August, each comprising three different urban or semi-rural farms in the greater Kansas City metropolitan area. Afternoon presentations on topics such as the basics of grant-writing, new regulations on food safety for produce growers and business planning followed meals prepared using vegetables and meats supplied by the local producers. There was no cost for the tours. crossbred hogs and crops of wheat, corn, soybeans, and hay in Leavenworth County. For the Theis family, the secret to the success of April Valley Farms was diversification. In the beginning, though, hogs were the focus, said Mark Theis, who heads up the swine operation. Every step of the operation is tightly managed to run on schedule, and has been since 1979. Sows are weaned on Mondays, bred on weekends, and alternated through a hot nursery to a floor-type pen for 21 days each and finished in a hoop house. “It’s like factory clockwork—boom, boom, boom,” Mark said. The regimen, as well as carefully controlled artificial insemination and infrastructure improvements, has paid off. The farm has consistently earned premium prices on the hogs, he said. 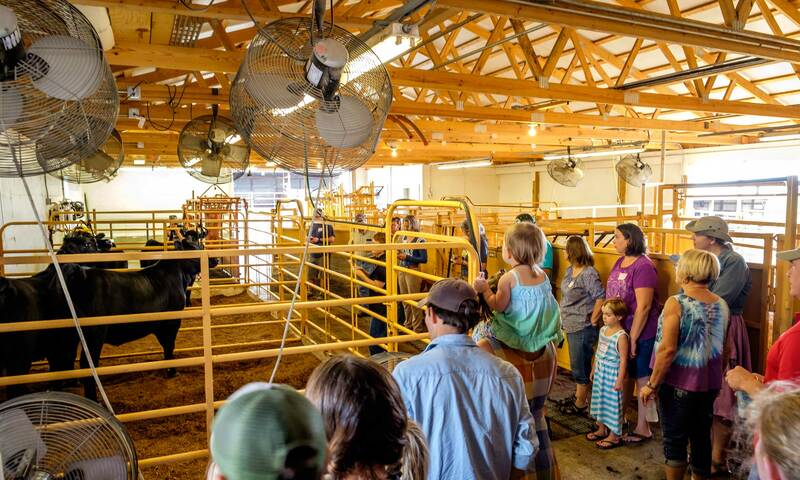 The family has invested in facilities such as a 24-sow farrowing building with a caged nursery, a cattle handling chute equipped with electronic scales, and other infrastructure. For the Theis family, the secret to the success of April Valley Farms was diversification. The row crop operation is headed by Larry. Due to the size of their operation—they farm land for 48 individuals across several counties in addition to growing corn, soybeans and wheat on their own land—they’ve turned to technology to become more efficient. Grid sampling and yield monitors have allowed them to save money and time, he said. Jerry Theis heads up the cow side of the operation but, in a pinch, everyone helps out as needed. “We’re all responsible in some ways for everything when it’s crunch time,” he said. Having their children and grandchildren assist them has made the farm even more productive, he said. “There’s a spot for everybody, and everybody’s needed,” he said. 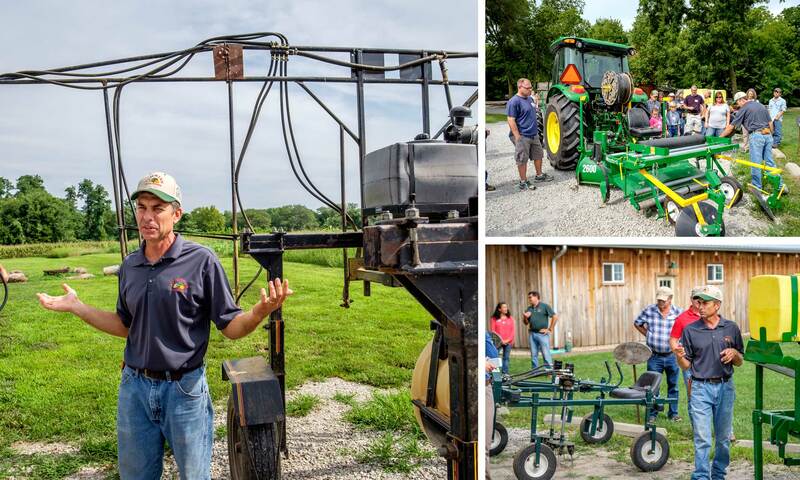 Joe Schwinn outlines labor-saving equipment used in specialty crop production. The second stop of the morning, Schwinn Produce Farm, is owned by the Schwinn brothers, Jay and Joe. It can best be understood as two separate businesses sharing the same acreage. Standing in the parking lot in front of a picturesque barn, Joe pointed to an area behind the tour participants. After Jay went to work at nearby April Valley Farms, Joe kept working the vegetable patch. “It was a 4-H project that just kept going,” he said. He earned a horticulture degree from K-State, built a greenhouse and borrowed money to buy a sprayer, just in time for a drought. It was his introduction to farming on a larger scale. 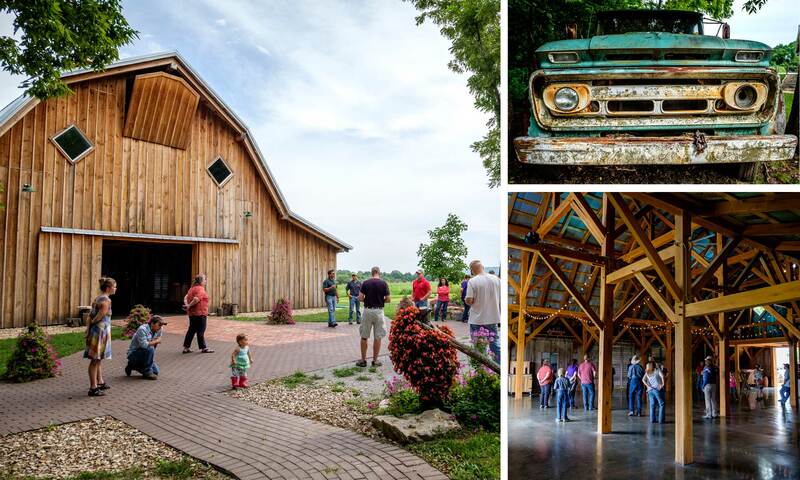 The Barn at Schwinn Produce Farm is 4500 square feet and accommodates approximately 250 guests. Branching off into pick-your-own strawberries and pumpkins has been successful, but again, not without conflicts—namely, the big barn that dominates the view. The 4,500-square-foot barn was Jay’s idea, based on a similar idea of a friend’s. Named, appropriately, the Barn at Schwinn Produce, the timber frame and wood peg structure is the centerpiece of a wedding venue that includes a small cottage for brides, a photo-worthy sunflower patch and an outdoor ceremony area carpeted with turf. More than 80 weddings were held there last year, and this year every weekend is booked including others throughout the week. 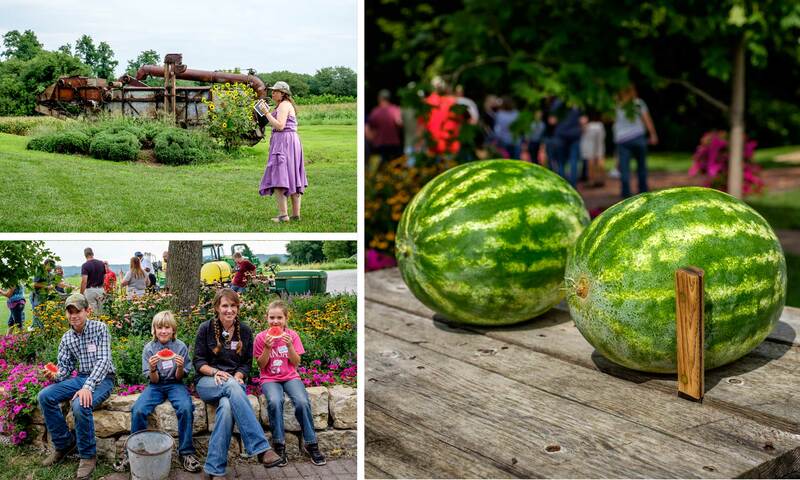 The Leavenworth County farm struggles to balance its U-Pick operation and the barn’s special events. “The barn’s been very good to us from a business standpoint,” Joe said, “but it’s kind of hurt us from an agricultural standpoint because we can’t do U-pick as much as we’d like to.” The single parking lot, while extensive, isn’t large enough to handle wedding parties and pick-your-own customers simultaneously, so the Schwinns are looking for additional ground for expansion. First, though, Joe would like to see an improvement in the weather. “I’d like to see a May and June where it doesn’t rain every day,” he said. 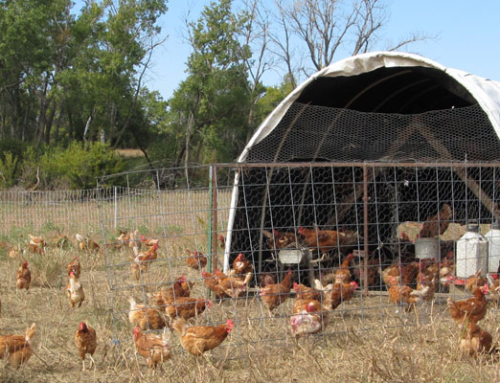 Loretta Craig supplements the chickens’ pasture-based diet with sprouted grains at Prairie Garden Farm. The third stop of the day was at Prairie Garden Farm, owned by Don and Loretta Craig. A long driveway leading to their home skirted a fenced field dotted with chickens. In the center of the field stood a large chicken tractor. The Craigs, both West Point graduates and retired military veterans, were working in the private sector when the stock market crashed. After Don accepted a job offer in Basehor, they began looking for a suitable place to live. For them, the metropolitan area held no allure, nor did its clusters of subdivisions. “I knew I wouldn’t do well living in a subdivision because I wasn’t interested in spraying my dandelions,” Loretta said. Don Craig discusses the value of the farm’s BCS walk-behind tractor. It was, Loretta said, something of an epiphany. So life-changing, in fact, that Loretta’s immersion into Victory Gardens has made her something of an expert. She now offers presentations to groups and organizations who wish to know more or to incorporate them into their own lifestyles. Victory Gardens were critical on the home front during the two world wars, she said, and their importance hasn’t diminished over the years. They were also more encompassing than their patriotic title suggested. “Our gardens are a little bit of everything,” she said. Vegetables were only a part of the equation. 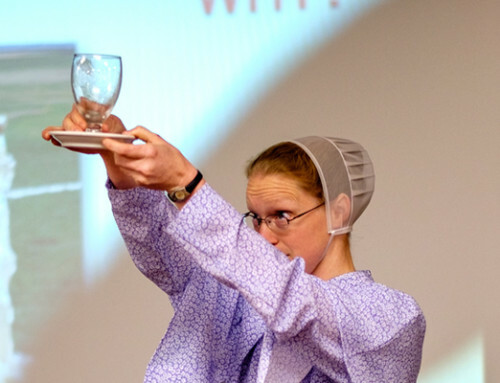 Meat was a secondary consideration, and while the couple debated adding either sheep or cattle, they ended up with cattle and a sheep dog, followed in short order by chickens. “Anything worth doing is worth doing wrong the first time,” Don quipped. This year, the Craigs were awarded a grant through the Farmer Veteran Fellowship Fund which will go toward a U-pick blackberry operation. 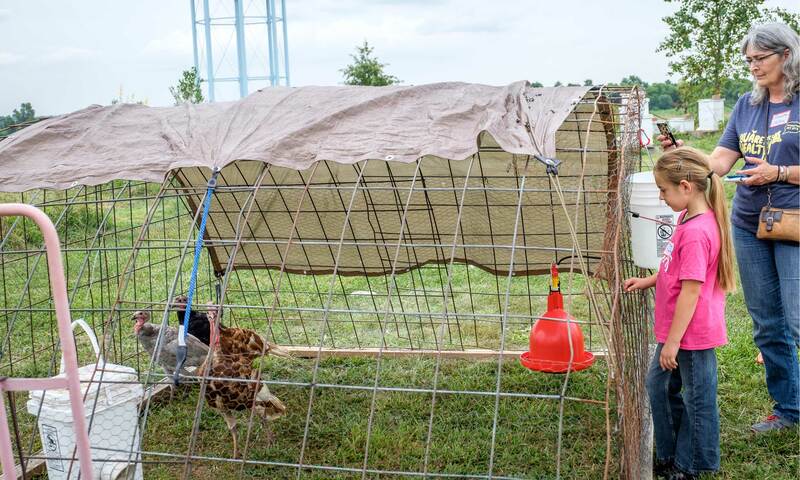 Pasture-raised turkeys are a recent addition to Prairie Garden Farm. 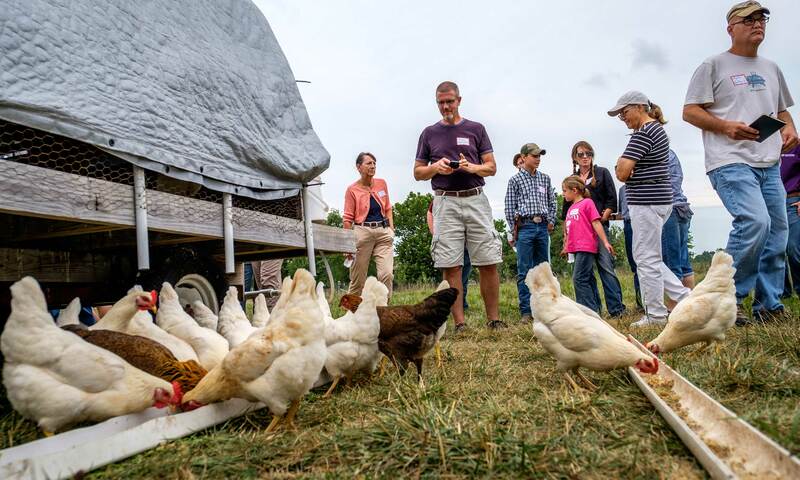 The Summer Fun Farm Tour Series was made possible through funding from Farm Aid and a Frontier Farm Credit sponsorship. 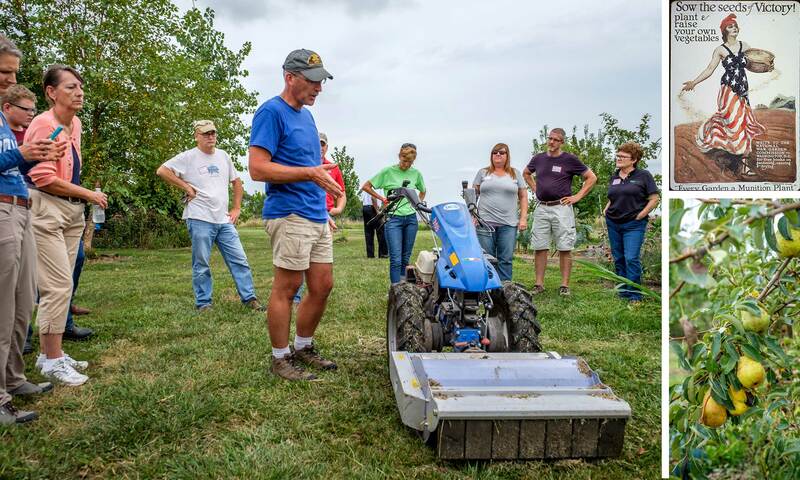 Tour partners include Kansas Farmers Union, Farmer Veteran Coalition of Kansas, Kansas Beginning Farmers Coalition, Kansas Center for Sustainable Agriculture and Alternative Crops, and Kansas AgrAbility. 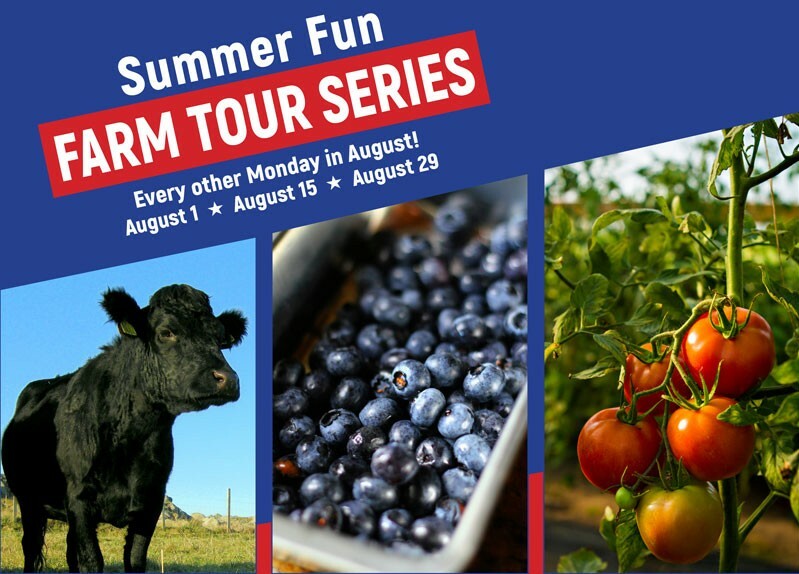 The Summer Fun Farm Tour Series is made possible through funding from Farm Aid and a Frontier Farm Credit sponsorship. 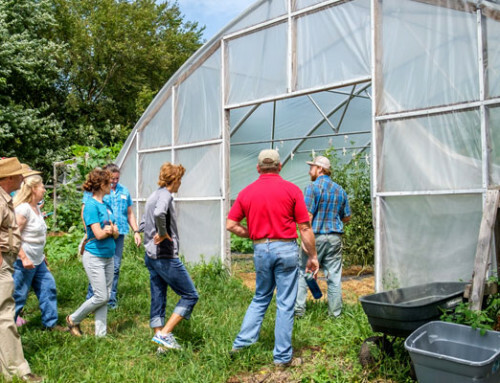 Tour partners include Kansas Farmers Union, Farmer Veteran Coalition of Kansas, Kansas Beginning Farmers Coalition, Kansas Center for Sustainable Agriculture and Alternative Crops, and Kansas AgrAbility. Click on a logo to learn more!